How do I take an assessment where I can only view one question at a time in Quizzes.Next? Your instructor may choose to build assessments that show one question at a time. This means you will view only one question on your screen at a time instead of all questions posted at once. 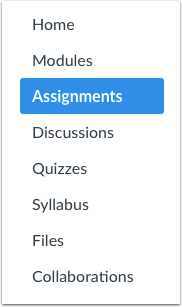 Note: If the quiz you are accessing displays a quiz icon instead of an assignment icon, your instructor is not using quizzes in Quizzes.Next, an upgraded quiz tool in Canvas. Functionality may differ between these quiz types. 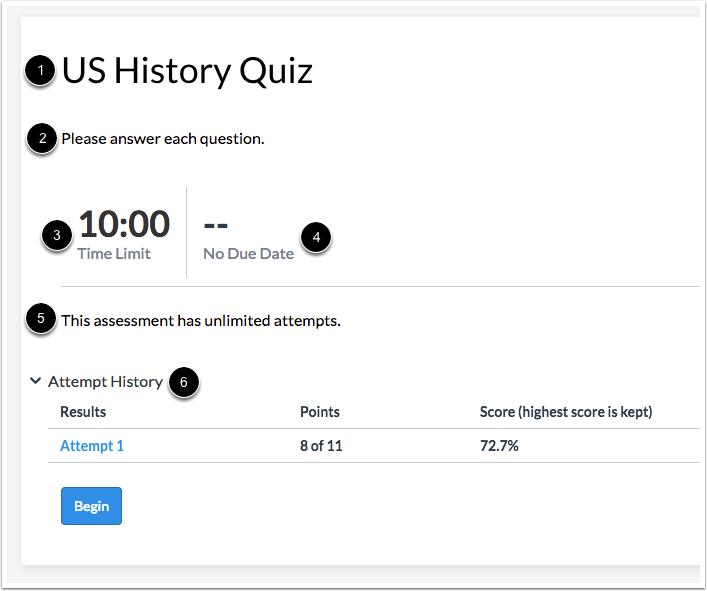 For help with viewing one quiz question at a time, please see How do I take a quiz where I can only view one question at a time? Assessments created in Quizzes.Next display the Assignments icon . To open an assessment, click the title of an assessment . From the assessment page, you can view the title , introduction , time limit , and due date . You can also view the amount of attempts allowed  and previous attempts of the assessment . If your instructor has disabled backtracking in your assessment, a warning message displays in the assessment page. The message states that the assessment is delivered one question at a time and going back to previously answered questions is not allowed. If your assessment includes an access code, enter the code in the Access Code field . Then click the Submit button . To begin taking an assessment, click the Begin button. Each question displays one at a time. To advance through the assessment, click the Next button. 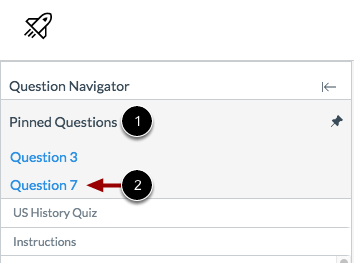 If your instructor did not disable backtracking and allows you to return to prior questions, you can click the Previous button to check your answers or return to questions you left blank. 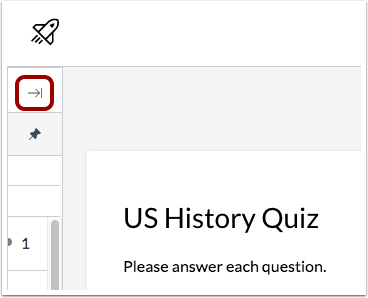 You can also use the Question Navigator to move between questions in an assessment. To open the Question Navigator, click the Expand icon. Note: If you cannot view the Question Navigator, your instructor has disabled backtracking in your assessment. To jump to a specific question, click the question in the Question Navigator . To pin a question to review later, click the Pin icon . Answered questions are highlighted in blue text. Unanswered questions are indicated by white text. 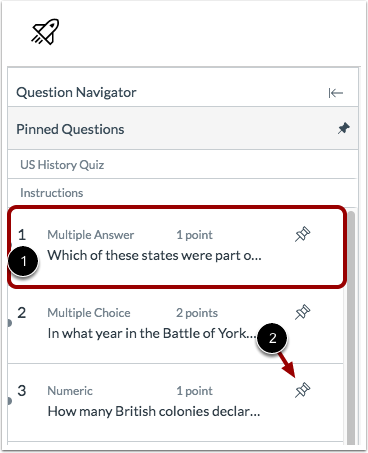 All pinned questions will display in the Pinned Questions section of the Question Navigator . To view a pinned question, click the name of the question . To open the on-screen calculator, click the Calculator icon. Note: If the Calculator icon doesn't display on the question, your instructor has not enabled calculators. Your instructor may enable a basic calculator or a scientific calculator. 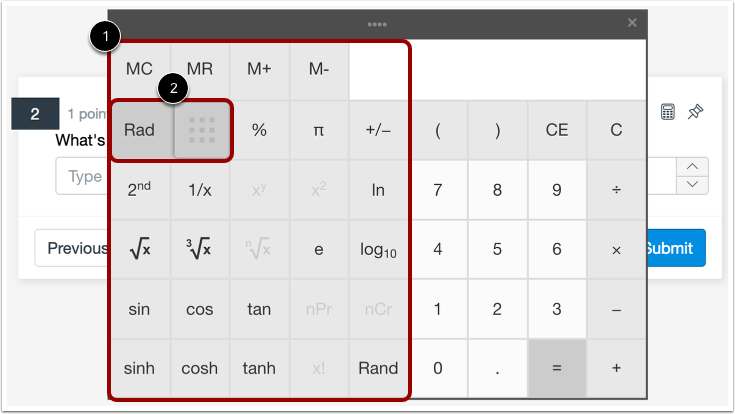 To use the calculator, click the number and function buttons or type numbers and functions using your keyboard . To clear a calculation, click the Clear button . Close the calculator by clicking the Close button . Calculations are saved if you close the calculator window. To move the calculator around the browser window, click and drag the calculator header . The scientific calculator includes additional buttons for more advanced functionality . Click the Rad/Deg toggle to switch between Radian and Degree mode . To submit the assessment, click the Submit button . To return to Canvas and resume the assessment at a later time, click the Return button . Previous Topic:How do I take a quiz where I can only view one question at a time? Next Topic:How do I answer each type of question in a quiz? Table of Contents > Quizzes > How do I take an assessment where I can only view one question at a time in Quizzes.Next?